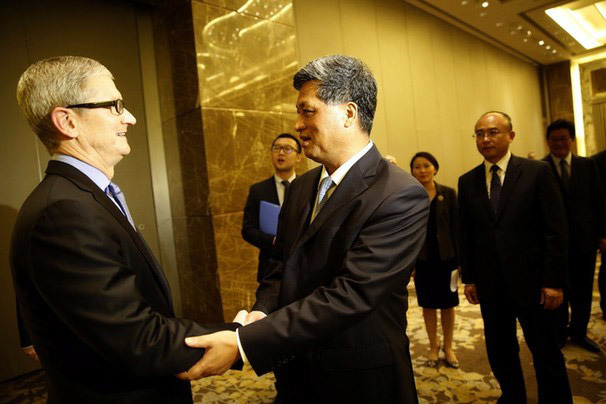 Apple CEO Tim Cook (left) meets with Party Secretary of Shenzhen Ma Xingrui. CEO Tim Cook made the announcement Tuesday night during a meeting with local officials as part of a national innovation summit, Reuters reports, citing the Shenzhen Economic Daily. According to the local publication, Communist Party Secretary of Shenzhen Ma Xingrui and his deputy, Mayor Xu Qin, attended the event. Foxconn CEO Terry Gou, whose company serves as a major Apple supplier and controls significant manufacturing assets in the region, was also on hand for the announcement. With the upcoming R&D center, Apple is looking to expand its partnership with Shenzhen, a bustling metropolis known for its prowess in producing high technology goods. Along with hardware manufacturing, the company is looking to foster local software developer talent with its investment. Apple, through manufacturing partners like Foxconn, employs over 100,000 people in the city. In an interview, Cook said Shenzhen has undergone tremendous changes since he first visited the city 20 years ago to inspect the manufacturing mecca. Cook went on to tout "Shenzhen quality" as an important contributor to successful Apple product lines like iPhone, adding that the city's factory processes lead much of the world. In an emailed statement to Reuters, Apple spokesman Josh Rosenstock offered further detail on the upcoming facility. "We are excited to be opening a new Research and Development center here next year so our engineering team can work even more closely and collaboratively with our manufacturing partners," Rosenstock said. "The Shenzhen center, along with the Beijing center, is also aimed at strengthening relationships with local partners and universities as we work to support talent development across the country." Apple also plans to open additional retail stores in the city. News of the Shenzhen center comes less than two months after Cook alluded to a similar R&D facility reportedly set to open in Beijing. Apple's investments are thought to be in response to recent revenue declines in the region. Last quarter, Apple saw Greater China revenue drop 33 percent year over year amidst cooling iPhone sales. At least part of the slowdown was blamed on the rise of more affordable Android smartphones marketed by local upstarts.